Honestly, nothing relaxes me more than opening up a new agenda and envisioning all the things written down in it. Something about it just instantly calms me down, and I love looking at my new agenda even though I don't have a ton of use for it in the summer. This year I switched things up again, and I got a...Day Designer for Blue Sky! I got mine from Staples, and while it says it is not available in-store, it definitely is, and I am pretty sure it's cheaper in-store. I feel like it was around $30. I knew I wanted a Day Designer this year, but since I had never had one, dropping $60 on a planner seemed like a lot for me, so the Blue Sky one was a perfect compromise. I actually like the format of the Blue Sky one a little better because the hours of the day are broken down by 30 minutes rather than just hours, which is super helpful for my classes that start at 3:30 or 6:30. It also doesn't have some of the sections that I knew I wouldn't use like Bills or Dinner, but it does still have the Top 3 and Gratitude sections. I'm actually super excited to go back to school and start writing in my agenda and be able to show y'all how I organize it. Today I also wanted to share with y'all some other agenda options that I love! Day Designer | Personally, I think the Day Designer it the perfect option for college students or anyone who has a lot of meetings/ time-based activities. Each weekday has it's own page while the weekends share a page. Each day is broken down from the hours of 5 a.m. to 9 p.m. Then there is a to-do list next to your schedule, and at the top, there are sections for your top 3, "Due," "Dollars," "Dinner," and "Don't Forget." Then at the bottom, there is a notes section and a daily gratitude section. If you want to see a Day Designer in action, I definitely recommend checking out how Dorothy organized hers in college. Also if you are interested in the Day Designer but want to kind of test out how you would use it, you can try it for free by signing up for their emails! That's what I did before I decided I wanted one. Day Designer for Blue Sky | I talked a lot about the Day Designer for Blue Sky above, and I want to save how I plan on organizing it for a post in the fall once school starts back up, but it's super similar to the real thing! The main difference to me is that the Blue Sky covers are hardback and then the hours are broken up by 30 minutes rather than by hours. Simplified Planner | I would consider the Simplified Planners to be the more girly version of a Day Designer. Again each day has its own page, but it covers between 6 a.m. and 9 p.m. There is also a to-do list and a notes section, so the format is a little more like the Blue Sky ones. Each agenda is so colorful and comes with stickers, which I think is super fun. Ashley shared her Simplified Planner and goes a little more in-depth about the setup for the planner! Sweet Caroline | The Sweet Caroline planners are your classic monthly/weekly planners. On the weekly spreads, each day is its own box, and it is set up similarly to the ban.do planners. My favorite part of these agendas, however, is how colorful the monthly dividers are. Each spread is so cute and festive for the month. Lilly Pulitzer | Ah, the classic. I used Lilly agendas for five years, and I think they are absolutely perfect for creating daily to-do lists. Sometimes I wish my life could cater more to one of these agendas, but I have so many time-based activities that I need something with an hourly schedule. 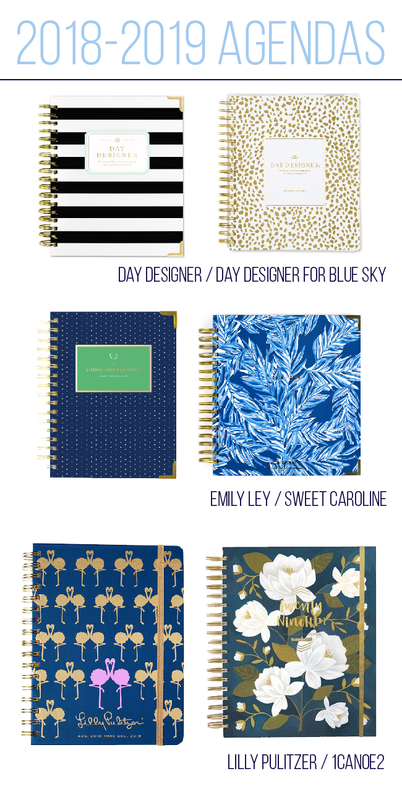 However, I think Lilly agendas are perfect for high school students or if you don't have a ton of meetings. Again, they are so colorful and happy, which made planning my life a lot better. You can see how I organized my Lilly agenda during my freshman year of college here! 1Canoe 2 | This was the agenda I used last year, and I really liked it. It's definitely more simplistic than something like the Lilly agenda. It's not as colorful, but I actually found myself liking that. The days aren't lined, which I thought would annoy me, but it actually didn't! I felt like I could fit everything I needed to on each day and never ran out of room to write down things.